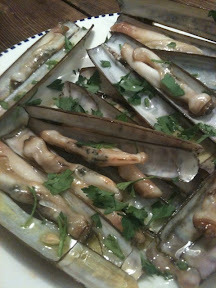 - Soak 200g clams in cold water for around 30 mins. - Cook 150g linguine until its nearly, but not quite, cooked. - Finely slice 1 clove garlic and gently fry in 2 tablespoons olive oil without letting the garlic burn. - Add 1/2 dried chilli pepper, finely sliced. - Drain the clams (discard any that remain open) and add them to the pan. - Add 80ml white wine or vermouth and cover. - Cook for 2-3 mins until the clams open, then add the linguine and cook for a further 1-2 mins. - Discard any clams which haven't opened, and serve sprinkle with parsley. I used fresh linguine, so i figured that i would just cook the linguine in the pan. Problem is that the linguine then absorbed a lot of the moisture in the pan, and it turned out a bit too dry, despite me adding more vermouth and water. Next time, i'll stick with fresh pasta, but plunge it into boiling water for 30 secs, before adding it to the clams. Can I just say, this was a stunning lunch. probably much more to do with the chef's skills than the recipe....Thanks Andy. Amanda, from LA.